My home in Dublin for this concert visit was an apartment just five minutes walk from the venue, at 35 Fitzgibbon Street. Staying close to the venue is essential, especially during tour start, when they normally do one or more days of rehearsals ahead of the tour opening night. On show day the police had closed the streets around where I lived. I walked around the stadium and I was surprised to see how close up to the stadium the locals lived here. 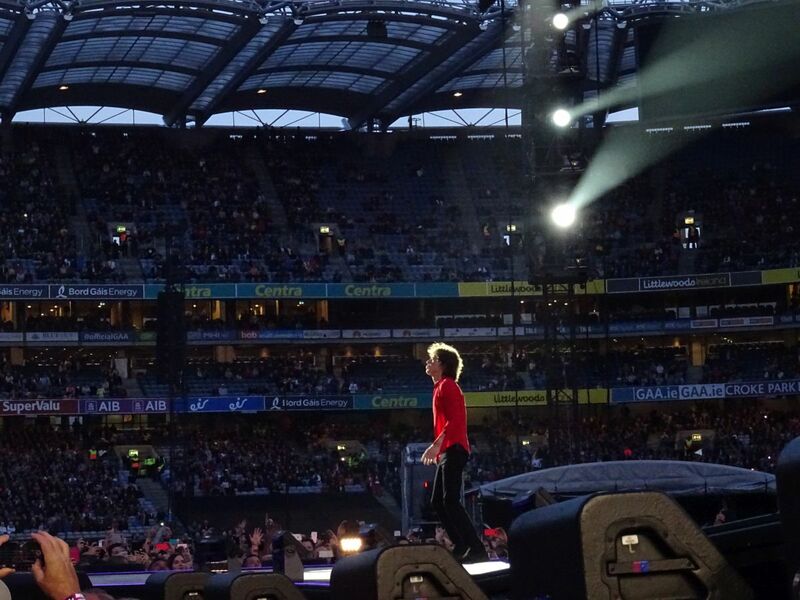 There were houses and apartments on all sides of the Croke Park stadium. At 4:30pm I walked down to my local Italian restaurant W and had my final concert meal. At 6:30pm I walked into the stadium. Access was so easy! While it took just 5-10 minutes to get inside at Croke Park, I have spent hours at other shows, just getting to and into the venue. I have been ready for this "UK plus plus" tour since last summer, and I have been preparing for this since the last show in Paris, but as the time is ticking and we get closer to show time, my heartbeat is as usual ramping up minute by minute. Friends I meet talk to me but I am in zombie state, my wife would know, my best friends know, but most others probably think I am just gone. My brain is on alert, it is on hold for the Stones. I have a ticket for the Pit B which means Pit Keith side. After a brief visit to the VIP lounge, where I met many friends, including Gazza (Rocks Off) and Doug (Shidoobee), I was on a nerve and I just had to go down there. Arriving in Pit B around 7:15pm or so there was just 30-40 people there, of which I know may be half of them. I walked right to the front dead center and stayed there with two friends from The Netherlands and Greece, who I also met at the London rehearsals last week. Such a small world. The hour or so waiting was painful, but luckily time goes fast when you are among friends. The show started 8:30pm sharp. With a 10:30pm curfew I knew we would have a set list of max two hours. Charlie is the first one on stage. As the "Sympathy" percussions are running through the PA, Charlie makes himself comfortable in his carefully selected Irish green coloured T-shirt. This is my first "Keith side" pit show since probably Lucca. The problem with Keith side pit is you hardly see Charlie, you just get to see him when he is hitting his lefthand side main cymbal hard. Also you hardly see Ronnie, but luckily Ronnie is moving over to Keith and Charlie a lot. Also, Ronnie do take the stage front when he is doing a solo, which happened many times tonight. "Paint It Black" will always be a highlight for me. For the rest of my life. It is a must for me, and luckily it is in the set list these days. "Neighbours" is working great. I just love the beat and the power of it, and the way the band makes it work. To be honest, they did "Neighbours" many times during the two weeks of rehearsals, so it was not a big surprise, but a song is very different with a crowd, as compared to rehearsals. Hopefully "Neighbours" will be with us through the tour. It is a great Stones song. "Wild Horses" is highly welcome every time they play it. I know we are at the stage of the show where we get songs they will change every night, and I know these songs will be the special ones that will make the shows stand out, in addition to the crowds in each city and show of course. Comparing shows and tours is not my cup of tea. Still, I can't help thinking this is sort of "part two" of the tour that started last year, running fourteen shows from Hamburg and all the way to Paris. They used the two weeks of rehearsals well, to get rid of the rusty bits and to get back into the part two of the tour. Opening night here in Dublin is the safe set for them. We have to wait until UK and London, then they will open they open up their "Out Of Our Heads" vaults and do some of the stuff they have been rehearsing during the last couple of weeks, I hope. Keith was great all through the show. During the "Keith set" we got "Before They Make Me Run" and "The Worst". I loved the duet with Bernard on "The Worst". 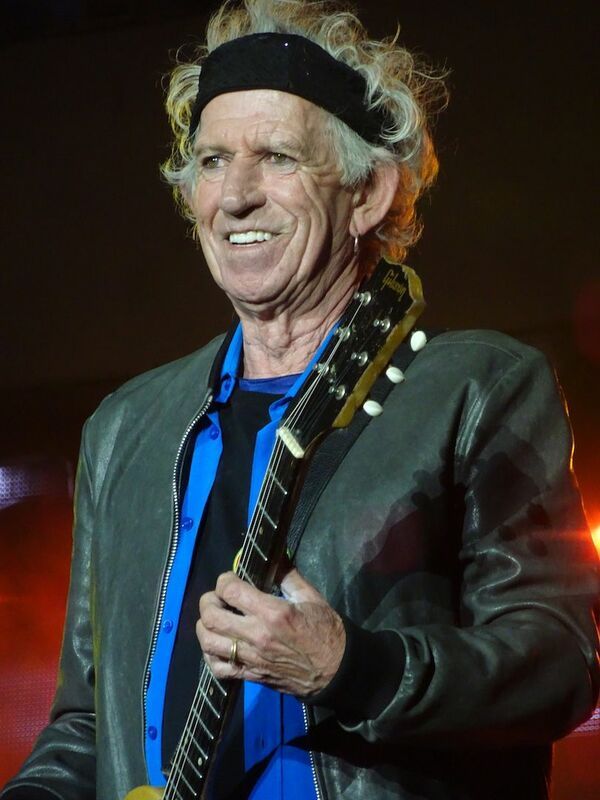 We got two new songs from Keith as compared to the tour last year, when Keith did "Slipping Away" and "Happy" at every show. So this was a 100% new set from Keith. 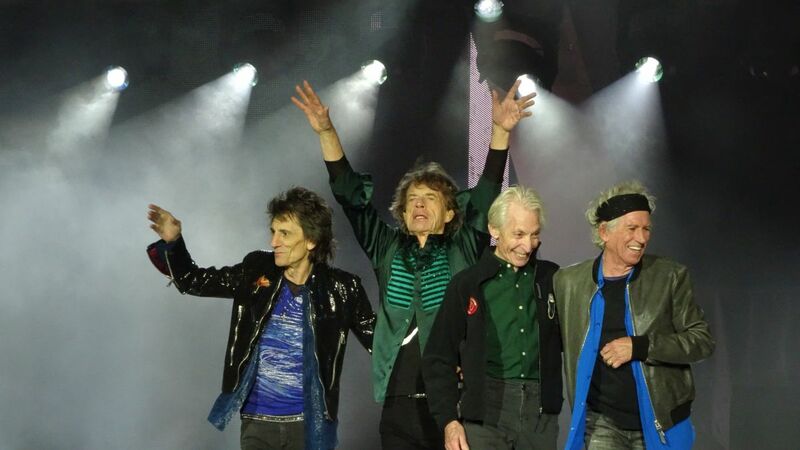 The rest of the show is the A-list of seven songs we will get for the rest of our lives, as long as The Rolling Stones will be touring. 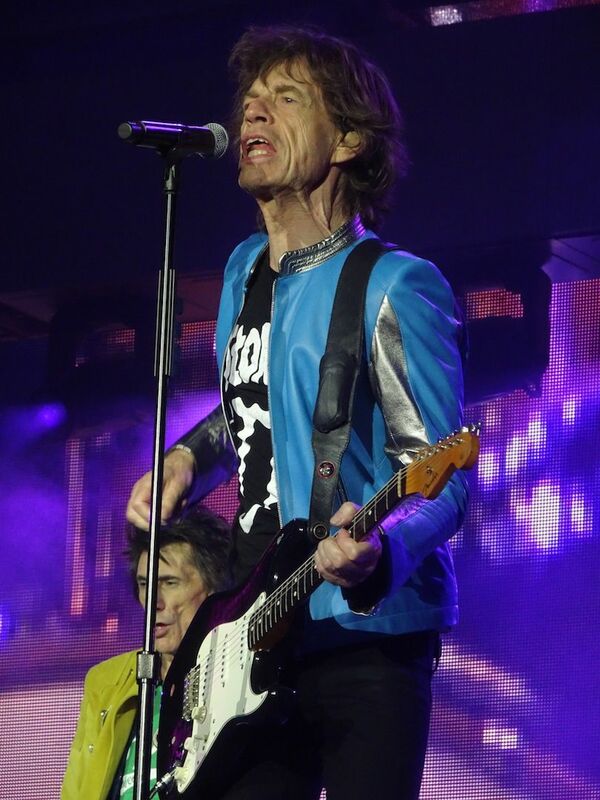 The highlights for me are "Midnight Rambler" and "Gimme Shelter". Such great songs. Never to be left out. The only song I missed was "Street Fighting Man". Please please get SFM back into the set list some way. I am sure it will be back for London-1 or London-2, but I must have it every time, please please! 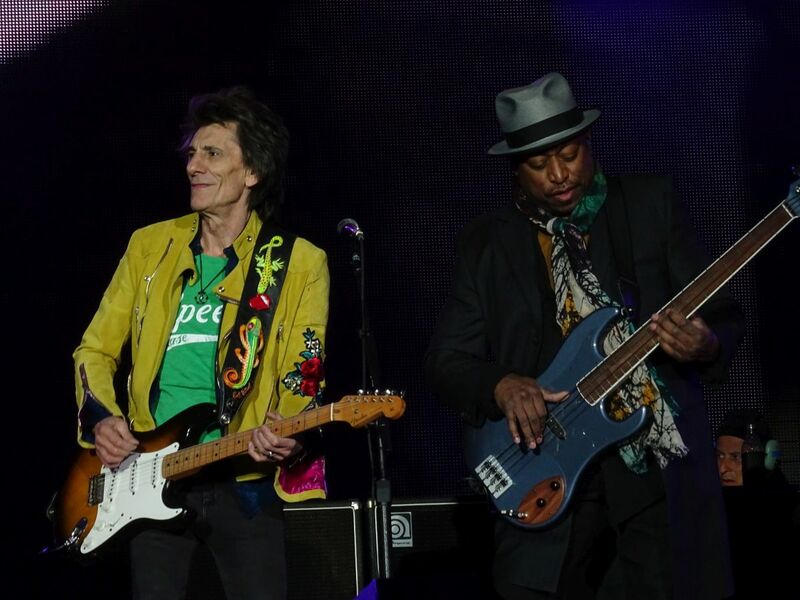 Mick was working hard, Keith was working hard, Ronnie and Charlie ditto. According to the press their combined age is now a very high number that does not make sense to anyone except for those journalists who care for such numbers. I don't care about combined age. I will love this band as long as they perform at the level they did in Dublin, and probably for the rest of my life anyway. Yes or No? That's been the big issue in Ireland these past few weeks. 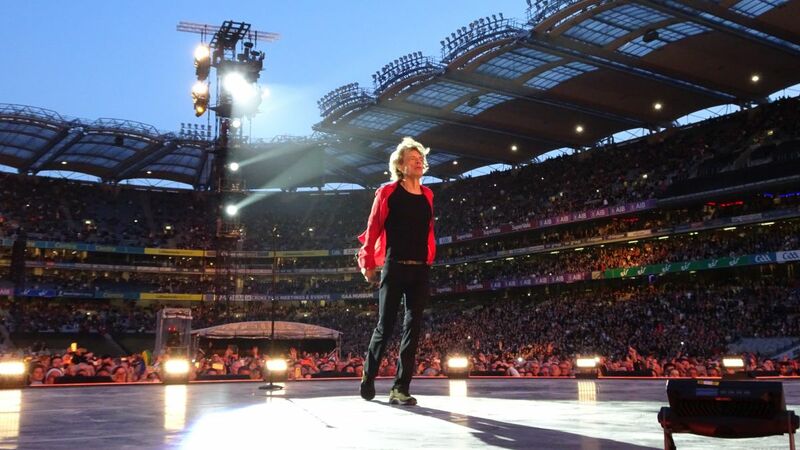 Would the downtrodden faithful show up en masse for the Rolling Stones' mildly controversial tour opener at the temple of Gaelic football. Or would they vote with their cheque books and stay home (thereby also avoiding the hellish rush-hour traffic)? The answer, as with everything in Ireland, was complex and convoluted. While the show wasn't an embarrassing "Markle debacle," I'm glad that the daylight start allowed Mick to see entire blocks of empty seats at the back of the upper deck and sporadically throughout the stands. I can't speak for the Pit and G.A. but there was plenty of space in the Gold Circle. I hope Mick grimaced as he calculated the ancillary income sacrificed to his greed. Apart from that, it was a respectable start to the tour at Croke Park on Thursday. 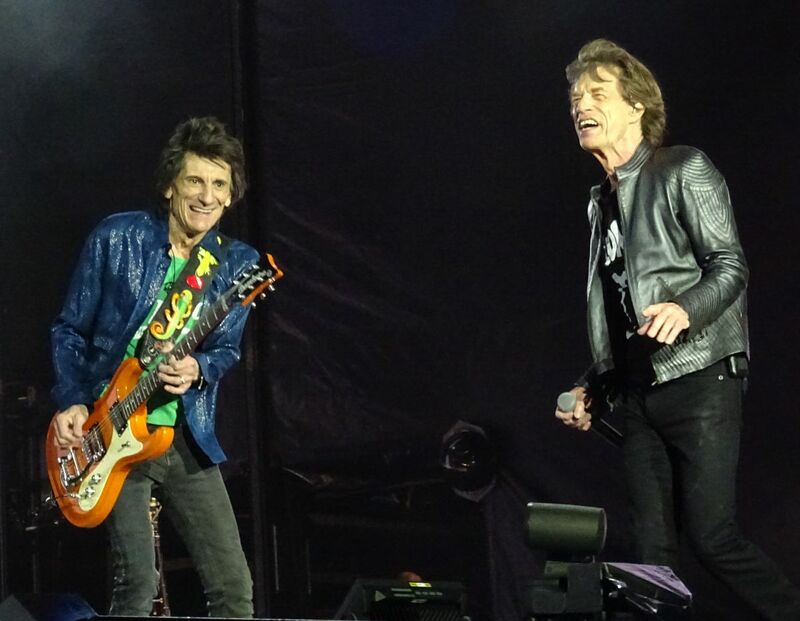 Looking and sounding fairly sturdy, the Stones dusted off "Neighbours," "The Worst" and "Before They Make Me Run" for a youngish crowd whose moderate enthusiasm outweighed its knowledge of the songs. While we expect the band to be a little rusty after each extended vacation, the only real problem was Charlie, who seemed uncomfortable with the brisk crosswind. 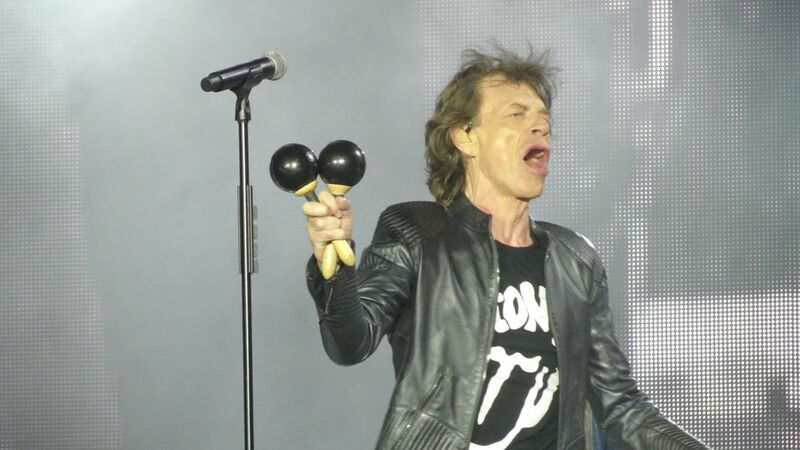 I sometimes wonder if the Stones should get a new drummer. Songs like "You Can't Always Get What You Want" and "Midnight Rambler" plodded along interminably. 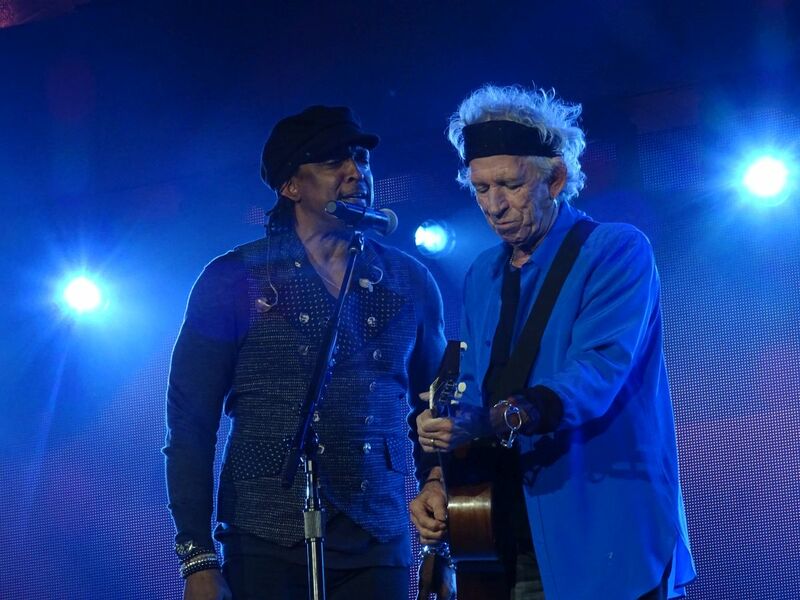 The weirdest moment was "The Worst," a lovely ballad that was presented as a duet between Keith and Bernard, who shared a mike on the chorus. I appreciate Bernard's hard work but am not comfortable with this set-up. On the other hand, if every song was similarly brief (two minutes?) we'd have a killer two-hour show. Keith's announcement that he would be doing "Before They Make Me Run" was met with stone silence from the folks around me. 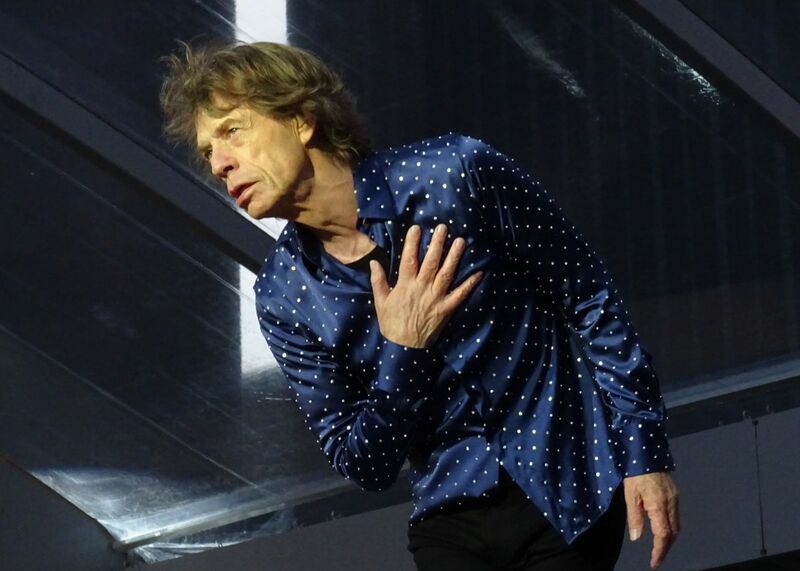 I also noticed blank stares during "Midnight Rambler" and, less surprisingly, "Neighbours," which Mick book-ended with an apology and then an admission that he couldn't get the right key. It's the throwaway song from Tattoo You, of similar banal and repetitive construction to "She's so Cold." Of course, "Wild Horses" and "Miss You" were firm favorites. Oy. 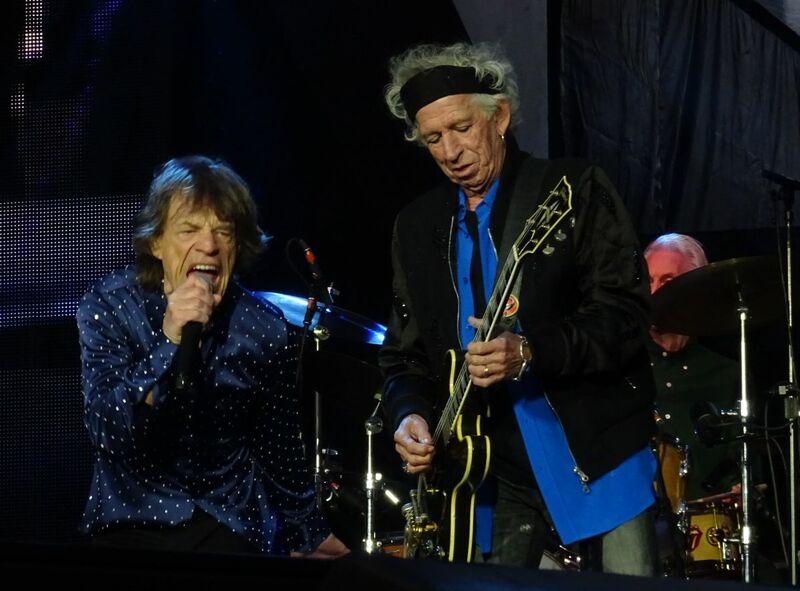 The Stones came on under a crisp blue sky at 8:30 p.m., and it stayed light for more than half the show until about the time of "Midnight Rambler." 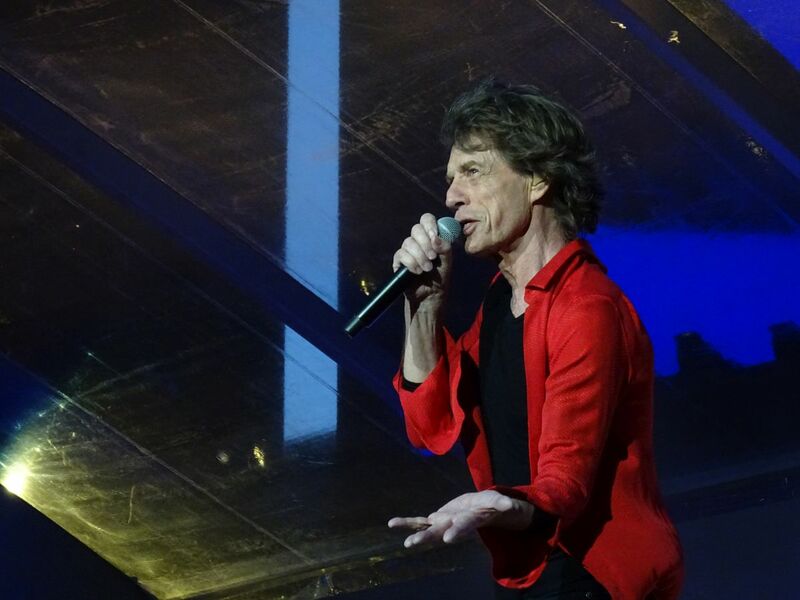 "It's so good to be here," Mick said after "Tumbling Dice," the second song." What a beautiful evening. Really nice, huh?" They again forsook an introductory video to go straight into the pre-recorded beats of "Sympathy for the Devil." 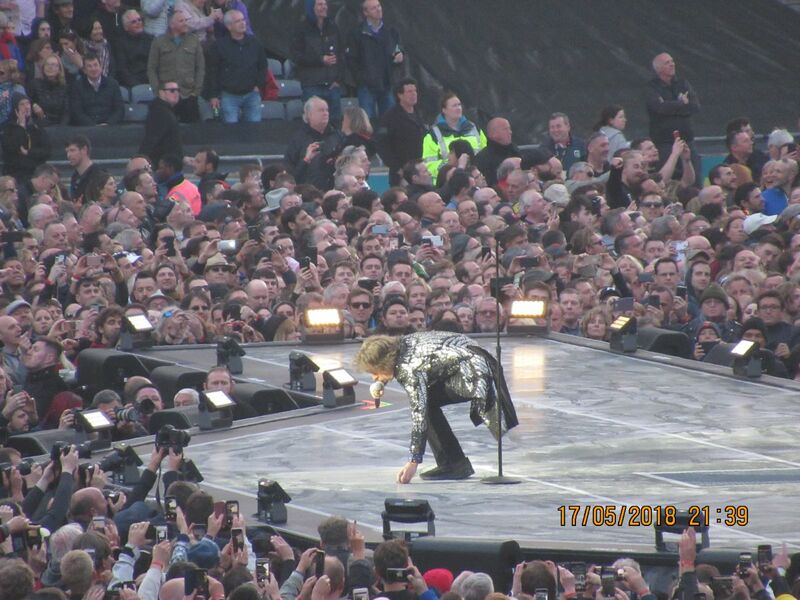 Mick came on with his glittery silver jacket and tails, performing a nifty triple twirl before uttering a sound. The sound was surprisingly low, perhaps a concession to neighbors who had tried to block the concert. All I know is that the guy behind me drowned out the vocals with some finesse. The mix definitely needed some work. Ronnie's dominating pedal steel was the other worst thing about "The Worst." On the other hand, I couldn't hear the backing singers for the entire show, which was great. 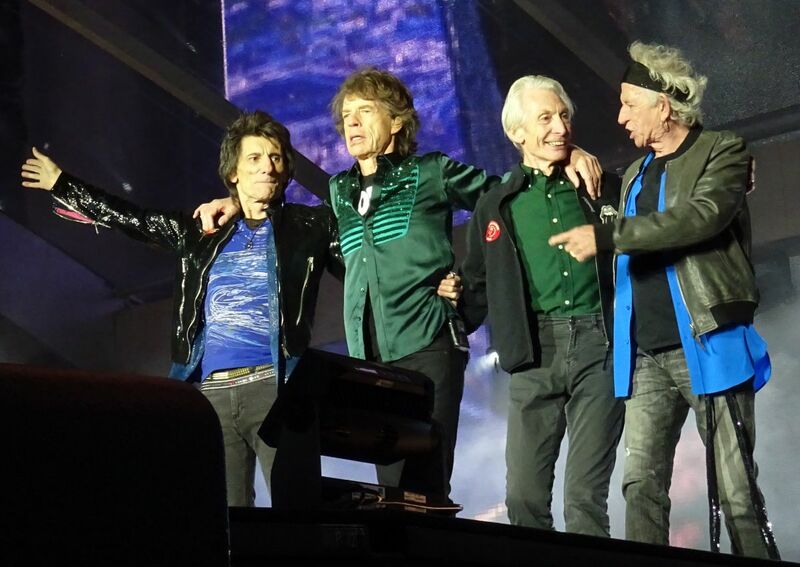 It quickly became clear that while a wholesale change to the set list would be unlikely, the Stones would not be averse to shuffling the deck. So "Tumbling Dice," "Paint It, Black" and the always excellent blues songs moved up the rotation, while "It's Only Rock 'n Roll" moved down. Man, I wish they would play more tracks off Blue and Lonesome. It's perhaps unfair to label them "blues" songs; they are more "blues-boogie" songs that people can have some fun with even on first listening. As is now the norm, all seemed comfortably amiable on the stage with the boys wearing big smiles. Mick trotted out his usual bespoke jokes, claiming that he had been both burned and soaked by the Irish weather, that the band had tried unsuccessfully to rehearse "Whiskey in the Jar," and had enjoyed a "religious" experience when they visited Temple Bar for a "spice bag," which Wikipedia tells me is a local delicacy consisting of "deep-fried chips, crispy shredded chicken and/or chicken balls, red and green peppers, sliced chili peppers, fried onions, and a variety of spices." He asked if anyone had come from Cork, Belfast or Termonfeckin, which is probably funny to the locals since "feck" is a mild version of "f*ck." I didn't get the sense that the musicianship was in top form. But that's OK under the circumstances, I guess. 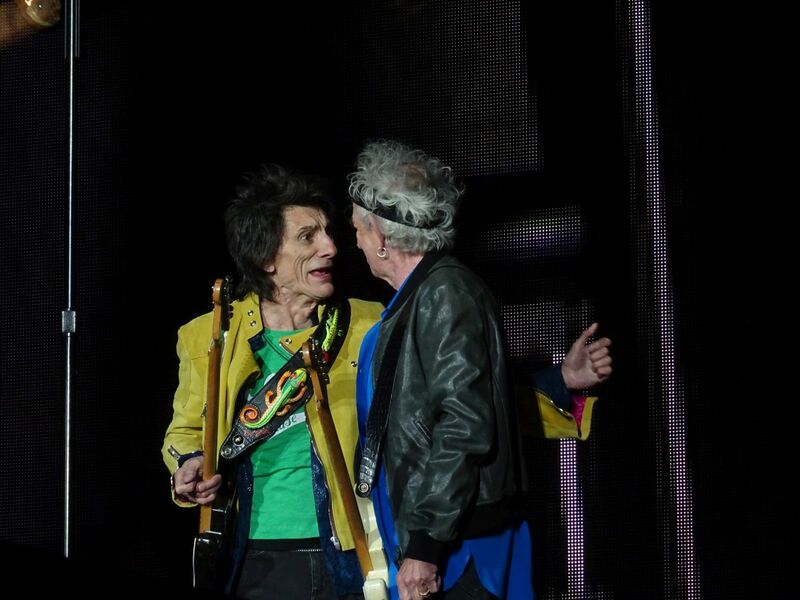 Mick seemed to lose his place briefly during "Start Me Up," while Keith allowed Ronnie to pull the weight on the guitars. The sax solo on "Neighbours" mercifully went to Tim Ries rather than Karl Denson. Ronnie, the "kid from Kildare" was the star of the evening, while Charlie earned some guffaws from Mick for wearing a green shirt. The show ended at 10:30 p.m. on the dot following "Gimme Shelter" and "Satisfaction," and I was back at my lodging by 10:34 p.m., surely a new personal best. The concert organization was extremely efficient and friendly. Take that, France, Germany et al! It was a shame that "Street Fighting Man" was dropped, but maybe it will reappear at shows with more relaxed curfews. Getting back to my original point, the pricing on this tour is unacceptable and I wouldn't dissuade budget-minded fans from caving in. But I think the doomsayers will be wrong and that the venues will - magically, perhaps - be largely filled up on this tour. Another year, another tour. 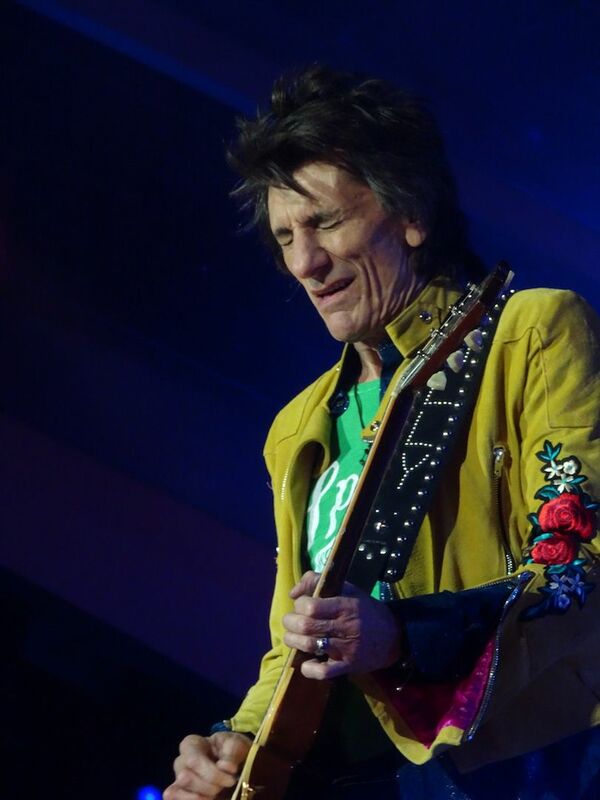 The 7th calendar year of Stones shows. They have never toured for so many consecutive years. 2018 started off in a chilly, but brilliantly sunny, Dublin. The first thing you should see when you fly into Ireland is the abundance of green. This is not called the Emerald Isle for nothing, and the root cause of all that colour is a reputation for the odd rainy day… The Stones were blessed, at least on show day, with no clouds and bright sun that helped offset the chilly northerly wind. On stage, out of the shelter, I was told it was cold. Charlie looked distinctly cold when he came out for his bow during the introductions. Croke Park – the third biggest sports stadium in Europe; the home of Gaelic sports; a place with some history, not all of it pleasant. 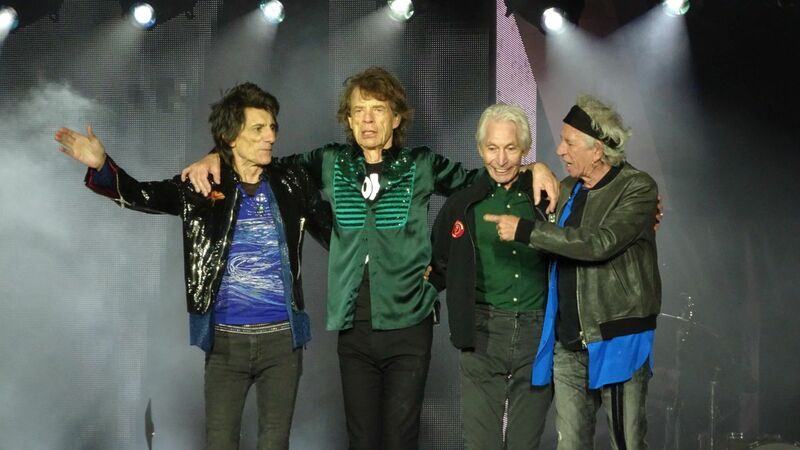 The Stones added another marker in that particular Irish Chronicle, with a great show to start off the 2018 No Filter Tour. Dublin is towards the west of the time-zone, and fairly north (same latitude as southern Alaska) so the sky was still very light when the show started to the rhythms of Sympathy. I liked the first hour of daylight. From the Pit it changed the visual dynamics positively – I’m not sure if it helped the contrast for the folks further back. As with the shows last year, Sympathy is a great warm-up – the gradual entrance of each member of the band; the beat; the opportunity for an early chorus chant from the crowd; the power chord to mark Keith’s arrival. I didn’t see the first show last year, in Hamburg, but the recordings showed some “loose” playing. Dublin was far better. I’d heard some of the rehearsals in London and the band sounded tight; a well-oiled and humming machine. Despite the impact of the chill on fingers and throats, this was a great performance. We quickly rattled through to the first “unusual” track: Neighbours. 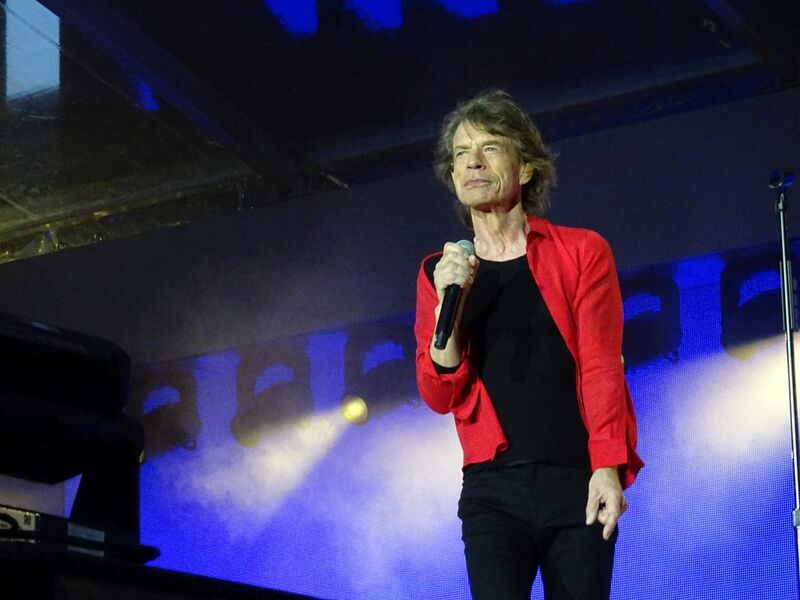 I’m not sure whether this was paying some kind of homage to the locals who tried to ban the show (Mick diplomatically said nothing), but it sounded as much of a generation 2 rocker as it did when I last heard in live in Stockholm in 2003. A real blast including high-energy guitar riffs and sax solo. 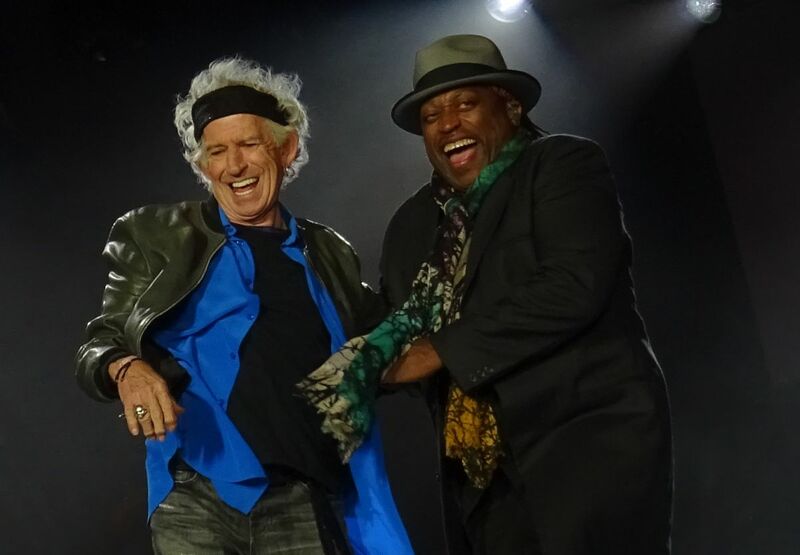 That rocking energy seeped-through into several songs – including the “blues” duo. Unreal harmonica playing Mick! Could we mix it up during these shows, playing some more from that CD? Two slow songs stood out. Wild Horses won the fan vote. Great song, although the cognoscenti would have preferred Moonlight Mile or Far Away Eyes. Played very nicely with Tim R also on keys and the usual guitar weaving. Keith played the Worst, dueting for much of it with Bernard F, which I felt worked very well indeed. I last heard it in Miami in 2005. It’s a great song – a pity more people near me didn’t listen better. Why pay all that money to chat and take selfies? The big hits had some of the freshness you’d expect from plenty of practise playing them… Shelter made the encore, and I liked that. The build-up of the “threat” in the song works well to re-start proceedings. 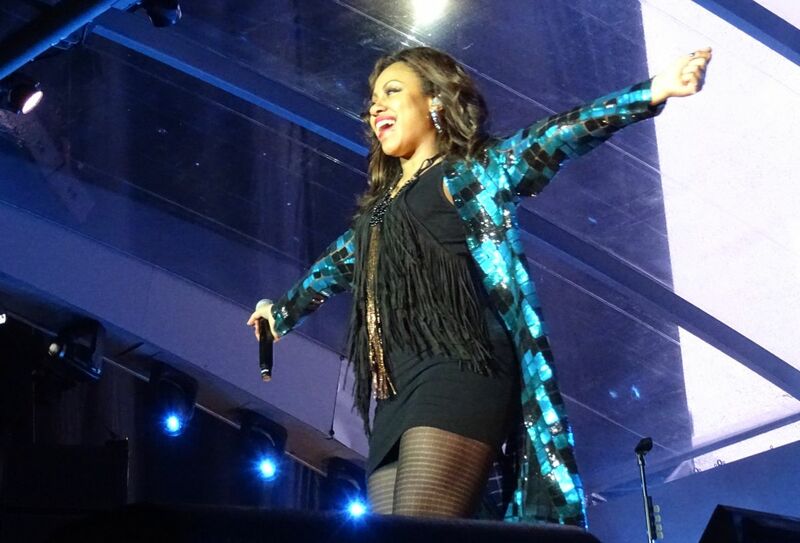 Sasha dueted strongly with Mick and moved out onto the mini-stage area by herself – confident to take the lead at that time. There were more counted intros from Chuck than I recall for while, and as ever he played some lovely keys – but mixed well down so hard to hear at times. Karl and Matt completed the ensemble very nicely. Complaints – a shorter than recent set-list, maybe due to the curfew and the lateness of many to get into their seats. That’s about it. There was the usual press comment before the show about slow sales – well the place looked pretty full to me . It seats over 80,000 but with 18,000 on the floor you will see a few empty seats in a 70,000 crowd. Y’all following the maths? The security and police inside and outside the ground were excellent – well-informed, no vagueness about where to go. Generally it felt very well organised. I did spy one amusing episode when a rather rotund local security guy told Keith’s manager to get off a step when she was taking some photos – if looks could kill! And it was totally unnecessary. Overall, Croke and Dublin helped out on a great show. Inevitably, each year, you look at the core band members for the dreaded signs of “maybe this could be the last time”. Charlie looked cold and was lightly, if elegantly, dressed. 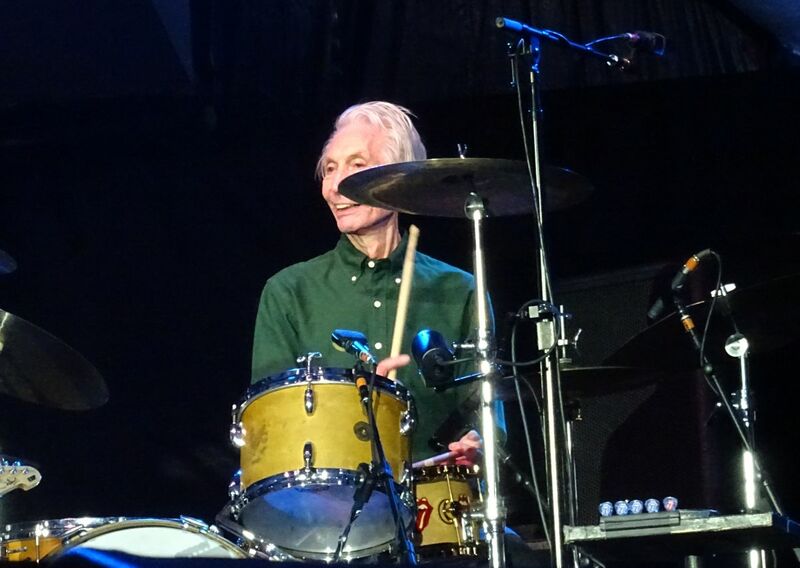 But he played with the seemingly relaxed power we expect, stroking and bashing the drums in equal part – effortlessness that underestimates his skill. 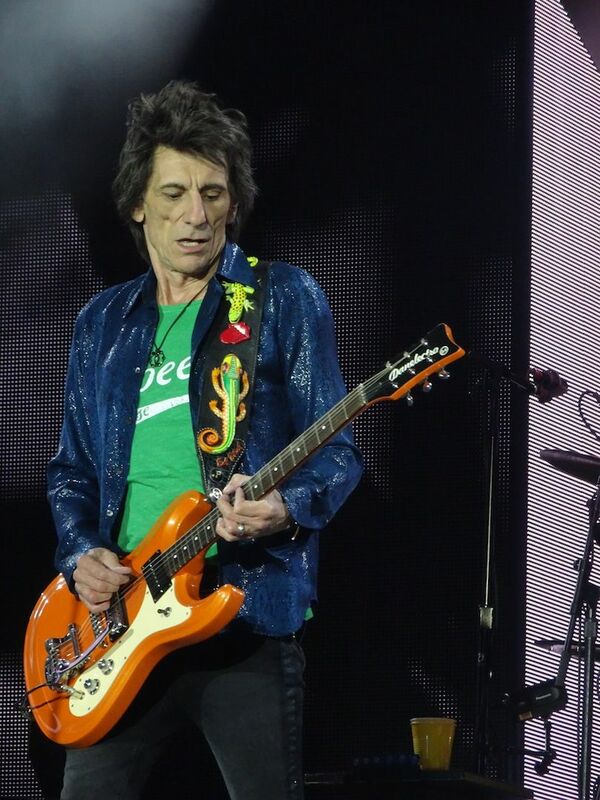 Ronnie, introduced as the man from Kildare, was as ever a ball of energy and playing some great licks and solos. 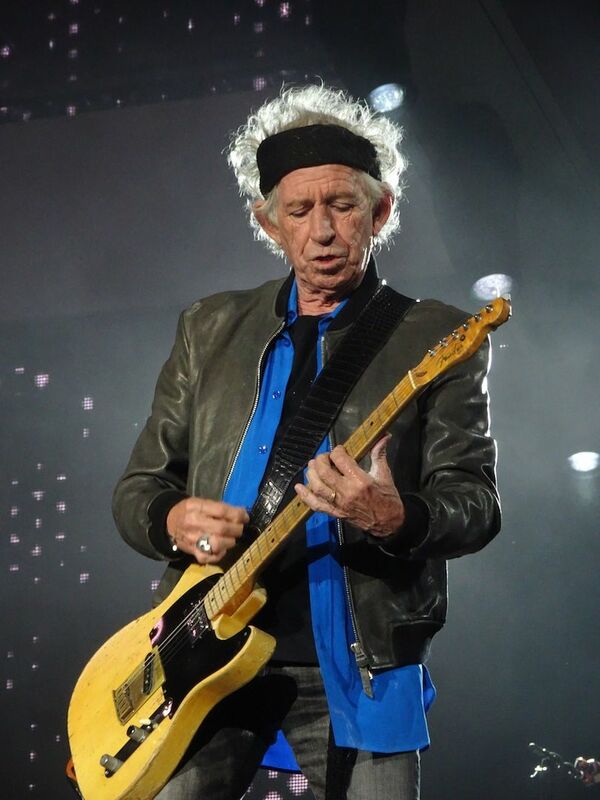 Keith had a very strong night, singing well and some great playing – Rambler stands out in my mind. I still find it hard to comment on Mick, the best all-round performer of the last 2 or 3 generations at least. Very strong vocals; leadership; being the front-man; a ridiculous level of energy and fitness. Someone before the show described to me the band and their entourage as a family, and the fans in similar terms. That’s just how it feels – well put Ms SL. The touring party are top professionals, at the peak of their game, seemingly driven to sustain an almost impossible standard – and meeting it. The fan family, close relatives or the occasional ones that make up most of any show, feel the same. Thanks to all for making this show another stage in that journey. 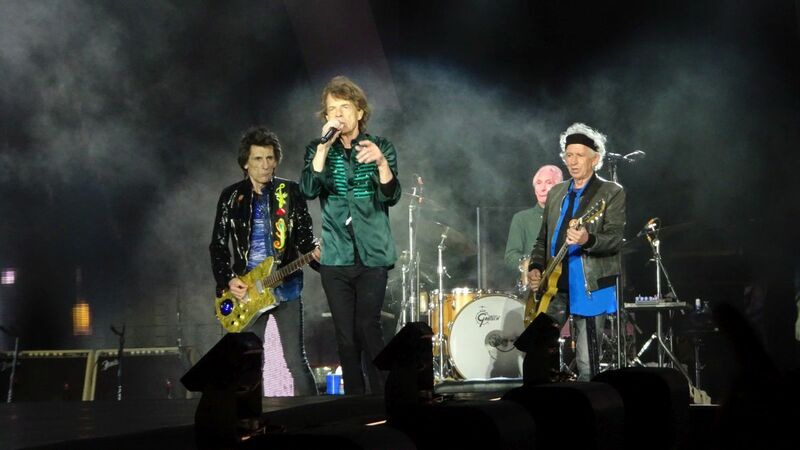 This was an wonderful fun concert.The venue was well organised and the weather was very pleasant.The Stones were hot. I've been to a few concerts over the decades and this was among the best. What made it so good is that the band are happy, relaxed but fully engaged, with their music with the audience. SFTD grabbed the audience as an opener and the pace continued with Dice and a great Paint It Black. I enjoyed the Blue and Lonesome songs. While Neighbours is not a personal favourite it was very well executed. Audience choice Wild Horses proved popular (I'd loved to have heard Faraway Eyes given Irelands love of Country Music ) YCAGWYW let us test our vocal chords and IORR /HTW upped the pace. Keith was in good voice on BTMMR but The Worst was a highlight of his short set. Now we are in the home run as I call it and every song was hit with the audience. 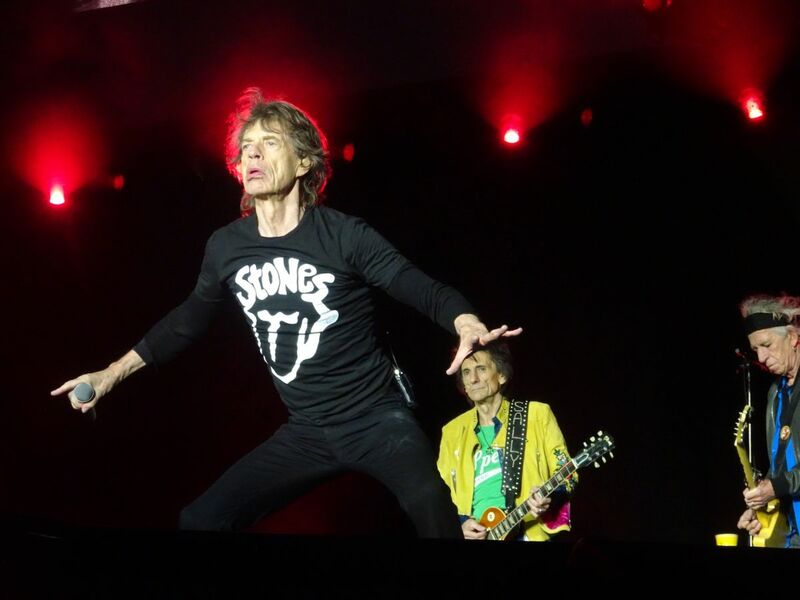 An unexpected highlight here was the take on Miss You with Mick in fine dancing form. The band excelled themselves on Rambler. Sure there's none of the menace of 69 on Rambler or Gimme Shelter even but while its only Rock n Roll it is Rock n Roll at its very best. Weather was hot when you were in the sun and quiet cold in the shadow and the wind. The dark side is "What, it's not à new tour ? We are just back in october 2017 !" The bright side is " What a powerfull show ! 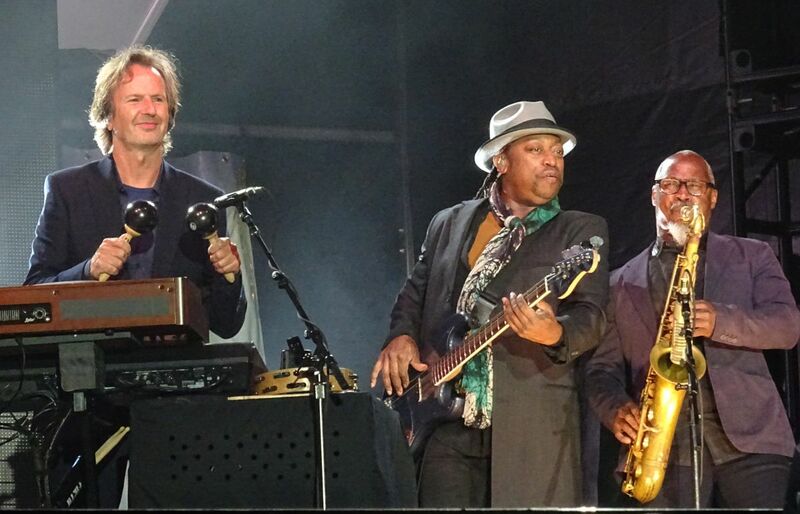 The band is in great shape, relax and smilling "
It is nice to be at the tour opener, though this is more like the 2nd half of the 'No Filter tour'. Unlike Hamburg last year there were no extended setlist with several 'rarities', which I was hoping for. Anyway, when they performed like they did last night there is nothing to complain about. I saw them 3 times last year, but this time around I think they might be better than last year. They all did a great job. I guess continuing after a 6 months break rather than 3 years has something to do with that. I will not comment on every song, the sound was very, very good in GC next to the pit on the left side. I found my GC spot around 19:15, GC left side, close to the pit rail and the middle of the catwalk. As I expected it was easier to get a good spot on the left side since the entrance was on the right side, and many just stayed there and did not bother to cross to the other side. 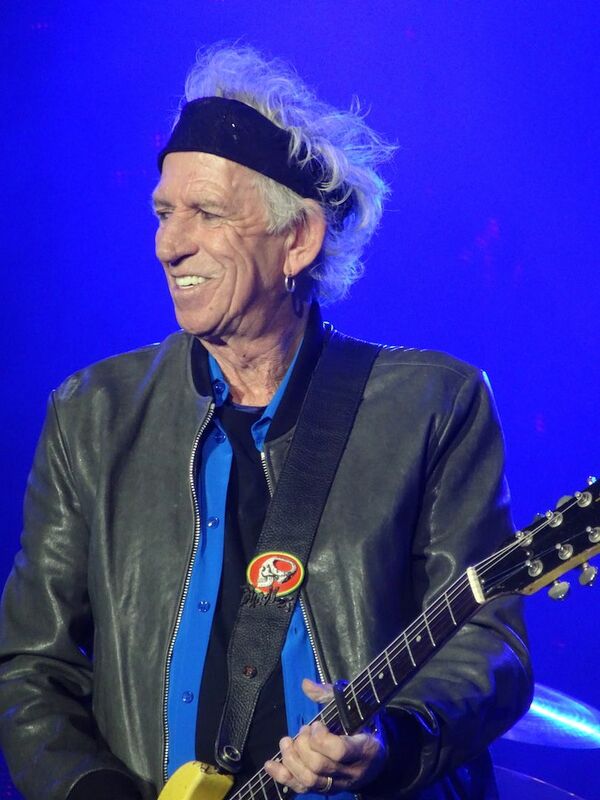 Keith was in great shape and I think he played and sang very well, but the same also goes for the rest of band. A very beautiful performance of 'The Worst' from Keith. 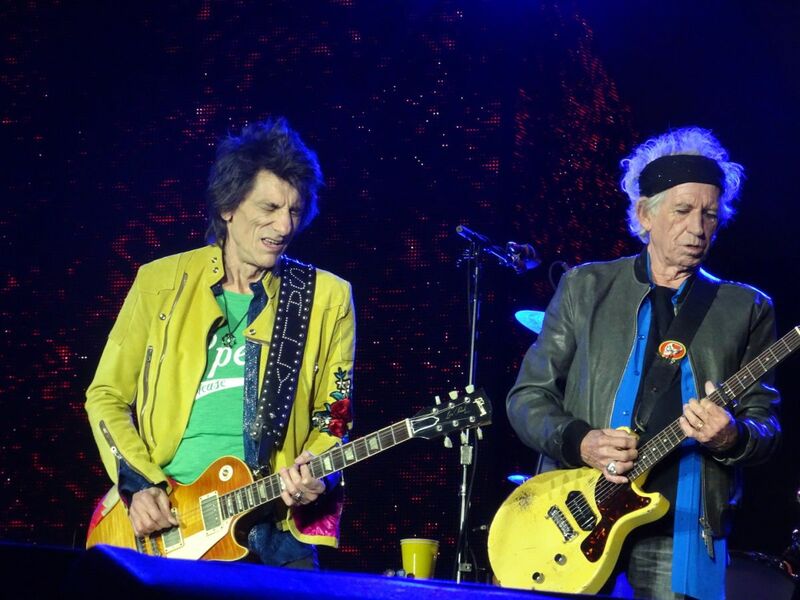 I would also mention the powerful, raw sound of both guitars this night, especially on Midnight Rambler, cutting through the air like a razorblade. 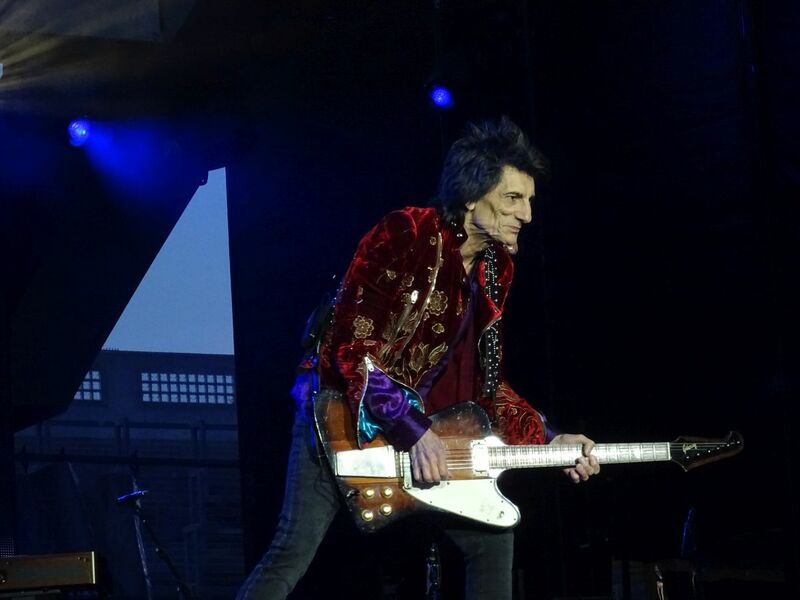 Mick, standing on the end of the catwalk turned his head when Keith hit that sharp, single chord at the right moment, and Keith was a big smile. Also fun to hear 'Neighbours' live, good version, and excellent guitar work by Ronnie. Surpringsly many young people in the audience, the young girls next me to loved to sing and dance to Miss You, so I can understand why it is kept in the setlist. In GC it was a mix of all ages, 2 elderly ladies, probably in their late 70s where standing by the rail on my right hand side. In the pit I saw mostly elderly men of 50 ++ (like me) before concert start. But I also saw 2 girls from Norway in 'bunad' there, not a bad way to spend the Norwegian national day. The pit seemed very empty close to concert start, but before concert start I think they filled it up with people from GC (? ), saw a lot of those red/gold GC wristbands in there. From the pictures I have seen both GC and the pits looks full, so maybe the GC section was filled up from GA as well? After what I saw and heard yesterday, I can easily see them going on for a few more years. Just don't take a long time off. This was my first visit to Dublin, a very nice town, with very friendly and nice people. I will come back here soon. Sadly, I have only planned 2 concerts this time, Berlin will be next, but hopefully not the last one.